Presenting The Triple Door Gym Ultimate Pullup Doorway Bar! Now you can perform over 35 different exercises with just a single doorway chin up bar! 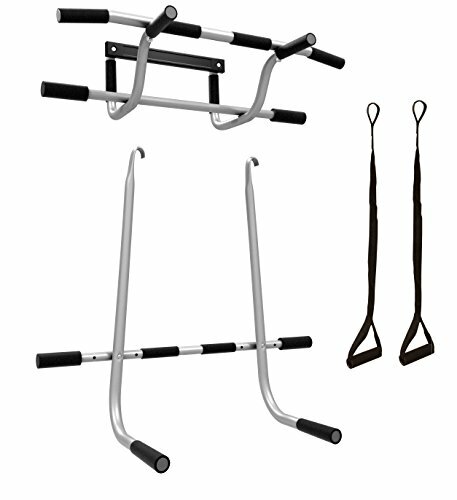 The package includes the Triple Door Gym pullup bar, unique steel extension bars for dips and heavy-duty suspension straps for suspended push ups and more! Transform your entire body with 1 doorway pullup bar and get a complete workout at home! You don't have to damage your door frame anymore in order to install your triple workout pullbar, since it utilizes leverage to hook on the solid uprights of the doorway without any screws, bolts or holes! Perfect for all doors from 26" up to 34", the Triple Door Gym can hold up to 300lbs of weight! UNLIKE OTHER FLIMSY & IMPRACTICAL DOORWAY PULLUP BARS that may damage your door and train only one muscle group, the Triple Door Gym is the ONLY pull and dips doorway gym bar that hooks on your door without any screws, holes, bolts or damage! WORK EVERY MUSCLE GROUP IN YOUR ENTIRE BODY from the comfort of your home with our premium chin-ups door bar, that combines pullups, dips and suspension exercises! Plus, its simple design makes it ideal for both beginner and advanced athletes! 35 DIFFERENT BODY WEIGHT EXERCISES will allow you to transform your body without having to waste your money on costly gym subscriptions! The Triple Door Gym doorway pullup bar is perfect for dips, pullups, bodyweight rows, leg raises, suspended push-ups and many more exercises! If you have any questions about this product by Matrix Ventures, contact us by completing and submitting the form below. If you are looking for a specif part number, please include it with your message.